The Mets recently picked up A.J. Ramos, signaling that they intend to try to contend again next season. Moving Reed is hardly surprising, then — he’s a 28-year-old stretch-run rental. What the Mets have received is a trio of right-handed minor-league relievers measuring at 6-foot-2. As usual, any one of these young players could suddenly emerge to become a relevant big-leaguer. Yet the Sox haven’t subtracted from the top of the farm, and now they’ve grabbed one of the more extreme relievers around. 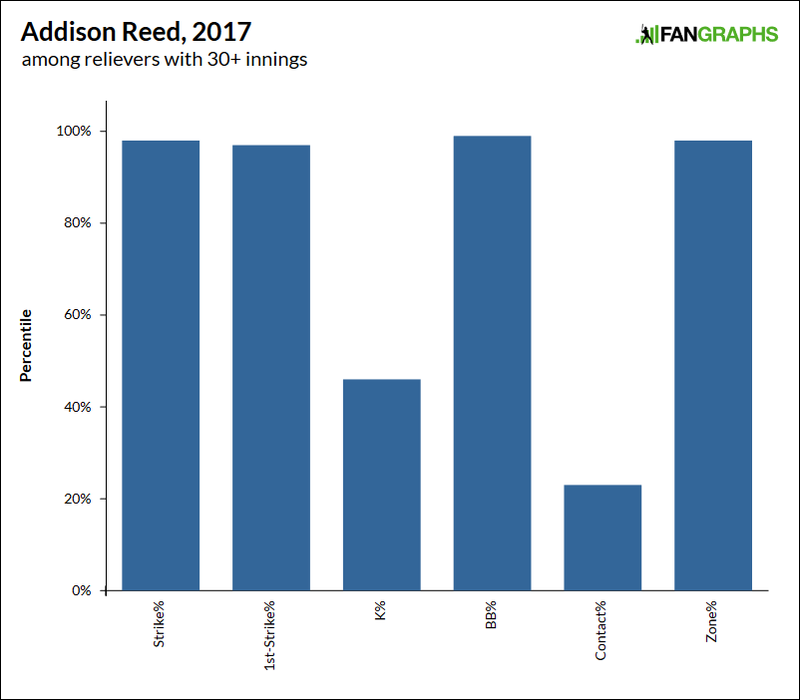 Reed hasn’t been what you might consider the typical closer. He hasn’t struck out every other batter, and he doesn’t have a high-90s fastball. You don’t look at Addison Reed and figure him to be overwhelming. What Reed doesn’t do is overwhelm the opposition with power. Rather, he attempts to overwhelm the opposition with strikes. For every 10 pitches that Reed throws, only three have been balls, as he forever tries to keep the count in his favor. It’s a different way for a pitcher to stay in control. Call it a more traditional method. It’s a sign of the times that Reed has struck out roughly a quarter of his opponents, and still his relative strikeout rate is mediocre. Reed misses bats, but he isn’t a bat-misser. He’s not Craig Kimbrel, and he’ll never be Craig Kimbrel. He’s all about those other high bars. Reed throws a gazillion first-pitch strikes. He throws a gazillion subsequent strikes. He pounds the zone and he doesn’t walk anybody. When Reed gets in trouble, it happens fast — somebody hits a ball out of the yard. That hasn’t been a crippling weakness. By the measures above, perhaps the most similar pitcher around is Pat Neshek. Neshek was also recently traded for three young players, and he also succeeds by staying ahead. While Neshek brings some additional funk, Reed is younger, and he supplies more velocity. In addition to that, Reed appears to be more durable — no reliever over the last two seasons has made more appearances on zero days’ rest. Reed can do the back-to-back thing, which managers deeply appreciate, and if there are any concerns that Reed might wear down from overuse, last September he allowed a .523 OPS, with one walk and 17 strikeouts. He’s about as rubber-armed as a reliever can get, and he has also held a minor reverse career platoon split. He is, in other words, a righty reliever that managers can trust against left-handed bats. That’s a new toy for John Farrell, who’s had to wear a path to and from the mound, playing the late-inning matchups. Good against righties? Check. Good against lefties? Check. Proven in critical spots? Check. Durable? Check. Reed does everything the Sox could’ve wanted, and although it’s probably a little frustrating to have had to go out and get another late-inning reliever, the situation is what it is. No sense crying over injuries now. And any organization can afford to lose a few minor-league relievers. There’s a live-armed minor-league bullpen arm on every street corner, and while a decent number of those guys will eventually earn some millions of dollars, good luck to anyone who thinks they know who’ll develop into a success. Baseball will never make it easy. Callahan, Bautista, and Nogosek, again, are all 22-year-old righties. When Eric examined the system last offseason, they were each included among “other prospects of note.” Callahan is closest to the bigs, having made 22 appearances in Triple-A. He continues to run low contact rates, but he’s in need of further polish around the edges. Bautista is a guy with a big fastball and a developing everything else. To this point he’s issued too many walks in high-A. Nogosek might move quickly, as a recent pick out of U-Oregon, but he has a funnier delivery that’s made him an awful lot more successful against righties than lefties. The majors include any number of relievers who’re far better against righties than lefties, but few of them are pitching critical innings, on account of that exploitability. Out of that group, the Mets could find three new relievers. More likely, they’ll eventually find one, and he might be more of a sixth-inning guy than an eighth-inning weapon. It’s the going rate for a rental, I guess, and Addison Reed was never going to fetch a package like Aroldis Chapman. Baseball values dominance. It knows less about what to do with control. That’s where Reed is elite, and it at least gives him and Kimbrel a certain contrast. Expect to see them leaned on heavily as a one-two punch. The Sox still don’t have the deepest bullpen around. And as they make this addition, so other contenders will make other additions. In part, it’s just about keeping up. But Reed will provide something Farrell hasn’t had. The Smith move didn’t go as they wanted, and the same could be said of getting Thornburg, yet maybe the third time is the charm. We hoped you liked reading The Red Sox Now Have a Second Good Reliever by Jeff Sullivan! Strictly speaking, shouldn’t that BB% percentile rank bar be very small?